An arthrogram is an imaging technique that uses injected contrast dye to observe the anatomy and function of a joint. Your doctor may order this exam to find abnormalities and causes of pain in the shoulder, elbow, wrist, hip, knee, or ankle. Arthrograms use X-Ray and fluoroscopy so the radiologist can perform the injection quickly. This exam uses iodine contrast to see images of bones and joints in motion. After the arthrogram, you may have a CT or MRI of the joint depending on what your doctor has ordered. Notify the radiologist of any medications, kidney problems, allergies, recent illnesses, or other medical conditions. If you are claustrophobic or anxious, sedation can be used. Remove jewelry and other accessories before the exam. Tell the radiologist if you have metal, medical, or electronic devices inside your body. Notify the radiologist if there is a possibility you are pregnant. You may need diagnostic x-rays before the exam. The area will be numbed and then the contrast dye will be injected into your joint. The entire exam takes around 30 minutes. 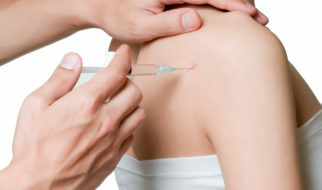 You may have a feeling of fullness in your joint after the injection. Swelling and discomfort in the joint is possible during the first 48 hours. Use ice to relieve symptoms. No recovery period is needed if you didn’t require sedation. The radiologist will interpret the results from the exam. Your doctor will discuss the results with you and decide if you need further treatment.